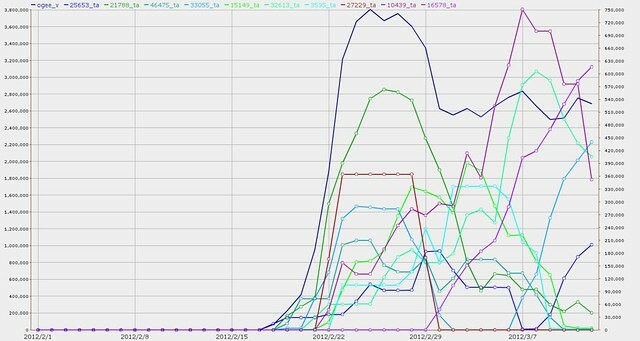 Did snowshoe spamming cause the big February spam surge? 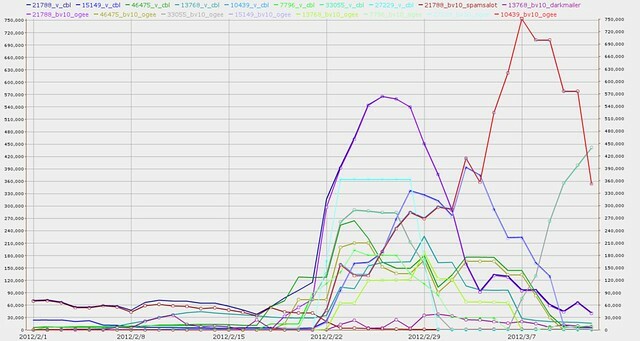 to the top of the U.S. February 2012 SpamRankings.net was not a botnet: it was apparently snowshoe spamming. Here are the most-affected eight U.S. ASNs again, with their rankings for February, listed in the table on the right. So, Ogee is not a botnet; it is a collection of IP addresses apparently involved in snowshoe spam. It's also not new. Ogee is just a specific set of snowshoe addresses. But what is snowshoe spam? Brett Cove, a researcher for anti malware firm Sophos, told attendees at the annual Virus Bulletin Conference on Thursday that so-called "snowshoe spam" is becoming a bigger problem, even as spam e-mail volumes associated with botnets are receding. Snowshoe spam is responsible for the bulk of spam messages that make it past anti spam filters at U.S. firms, even as bulk senders avoid prosecution by adhering to the letter of the U.S. CAN SPAM anti-spamming law. Snowshoe spam isn't a new problem. In fact, within anti spam circles, researchers have been talking about the phenomenon for years. The term "snowshoe" spam comes from the tactic of spreading the load of spam runs across a wide range of IP addresses as a way to avoid detection by anti spam filters, in the same way that snowshoes spread the weight of their wearer across a wide area to avoid breaking through snow and ice. Anti spam filters are typically programmed to allow only a small volume of identical e-mail messages from the same IP address range, Cove told Threatpost. Snowshoe spam is able to avoid—or postpone—the filters by sending mail from a range of addresses, often leased by the bulk mail senders, he said. a huge surge in spam from some U.S. ASNs, mostly from ones that hadn't even been in the top 10 before, with possible correlations in one ASN each from Peru and Canada. Did all this spam come from the same botnet? The chart also shows some ASNs reacted quickly and stopped the spamming, while others got worse. It's a busy chart, so let's look at simpler charts for one example each of resilient and susceptible ASNs. In the U.S. rankings by ASN, seven out of ten are new, and NOC number 1 came up from number 9. Something pretty bad is going on. So bad Comcast didn't place in the top 10 at all, for the first time in recent memory! There was even a similar curve in the World rankings, for Telefonica del Peru's AS 6147 SAA.